Since last we looked, Atlas's range of cables has expanded considerably and now covers pretty much all bases, across the range of audio requirements (short of the monumentally expensive). This is the middle of three digital/video cables and as such is probably the one most likely to appeal as an upgrade to basic CD transport/DAC installations. It's a classic, no-nonsense, 75-ohm coaxial cable of good construction, using a stranded centre conductor of high purity copper and a tape and braid screen for good interference rejection. The dielectric (insulation) is foamed polythene and Atlas fits some rather nice phono plugs, which feature direct gold plating over brass - some subjective evidence appears to indicate that the usual nickel intermediate layer has a sonic effect, though it's hard to imagine why or how. 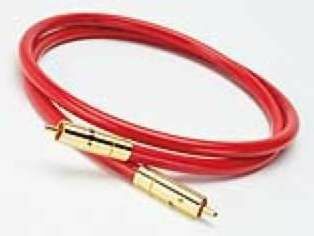 Be that as it may, this cable affords no grounds for knocking the direct gold plating approach as the overall sound is very good. Differences between competent 75-ohm digital interconnects are typically not enormous, but they are often audible. With the various transport and DAC combinations we tried, this cable consistently gave better fine detail and imaging than cheap and giveaway cables, and indeed it held up pretty well against a 'reference' handmade cable of very extravagant construction. Tonally there's little in it, but added detail often slightly improves the perception of bass tunefulness and treble air and that proved the case here. At this price, we'd say this cable is fine value.